Merry Christmas everybody! Tek & Steele aka Duck Down's own Smif N Wessun teamed up with Cookin Soul to give you this free mixtape for the holidays. This dropped yesterday but I was too lazy to post it up. Now I just gotta muster up enough energy to shovel my car out of the 8 inches (it was more like 2 feet) of snow it's buried in. Damn. "BET YALL DID NOT SEE THIS ONE COMING! HO HO HOES! OUR SPECIAL XMAS GIFT IS HERE! 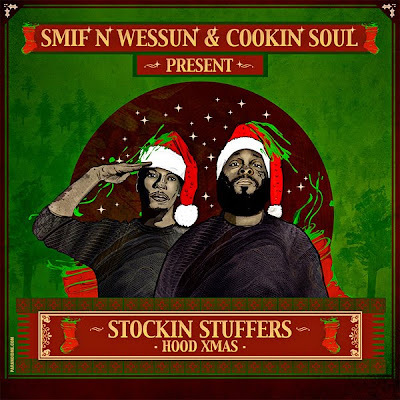 THE PNC BOYS, SMIF N WESSUN BRING YOU THE RAPS, OVER COOKIN SOUL BEATS SAMPLIN XMAS CAROLS = HOOD CLASSIC! MERRY XMAS TO EVERYBODY!!!"